The printing of clear images and photos can be achieved with the Canon Pixma G1400 as it is dedicated to this use. The unit can print in black and white, and colour. It continues to offer sharp colour across a high page yield, which makes it suitable for use in the home. This printer also benefits from being of a size that ensures that it is not inconvenient to position. The compact design of the Canon Pixma G1400 is one of the biggest bonus points of this printer as it does not take up a significant amount of space. The size of the unit does not detract from its ability to print a large number of pages, which is 6,000 when using black ink alone and 7,000 when using colour. The simple operation means that it is possible to practically plug in and go without the need for any complicated procedures. The size and the ability of the Canon G1400 makes it an ideal printer for a home office, and it is also capable of printing in both black and white, and colour. It takes the printer 60 seconds to print a 6” x 4” photo that does not have a border. The printer is simple to use and offers a cost-effective way of creating clear prints and photographs. It uses refillable ink tanks to avoid the need to repeatedly buy ink cartridges. 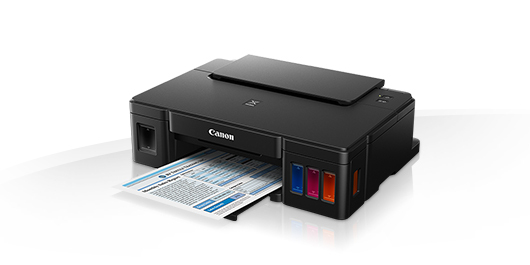 The Canon Pixma G1400 printer does not offer any other functions as may be required of equipment within a home office. Some users may find that the software that is available with the printer is a little limited.